Summer. 1945. And the end of a long world war. Most of the young Japanese who had gone to settle in China had been left behind. The dreams that carried them there had been crushed the moment Japan surrendered. Ai, Shunsuke and the other settlers were hanging in a balance of life and death as most Chinese villagers had lost loved ones to the Japanese military. Shanron and his aging mother helped these two Japanese, accepting them unconditionally. Inside of each of them was the beginning of a friendship beyond borders, the start of a love worth risking one’s life for. Lyn Churchill Jul 07 2014 2:38 pm beautiful movie -- Kei, you touched me deeply (the movie, your presence). Please let me know if it's possible to borrow or rent a copy to show my students at universities here in Tokyo. in Asia and between Asia and the world. Mona Mar 11 2013 2:24 pm Keiko san tells it like it was. As a Japanese lives in Japan to be honest about the history takes courage and strength. 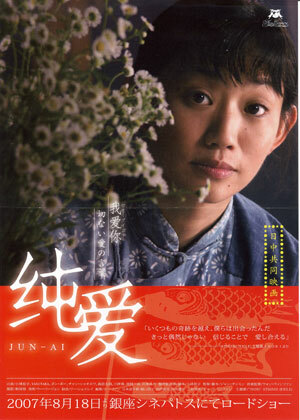 The heart touching story, beautiful scenery, good looking actors :) one of the best independent films I saw. Thank you Keiko san! Richard Ray Feb 27 2013 6:33 pm I have heard wonderful things about your lovely film and would love to see it. Where can it be purchased or rented? I just watched your film this evening in Sedona, Arizona. Much gratitude for inspiring this world towards Peace. I agree. Domo arigato. It made me feel.